Buenos Aires from the top view of the Panamericana Hotel is an incredible thing, a thing to remember. Maybe she thought about the view, maybe she didn�t. Witness say she ordered a coffee at the top of the restaurant of the Luxury hotel. Then she took her shoes off. And she must have walked a few steps barefoot on the top of Panamerican Luxury Hotel, on the 23rd floor. Barefoot, she must have considered the incredible view of the Buenos Aires. The majestic avenues crossing the city, the cars and the size of things. She must have witnessed the perspective that only can be seen from a 23rd floor in Buenos Aires. She was (and still is) 33 years of old. After ordering her coffee, and taking off her shoes, she seem to have decided to walk over the safety barrier. Then she fell from the 23rd floor. In Buenos Aires streets, televisions sets are common in every corner and shop. And for hours she was the news. 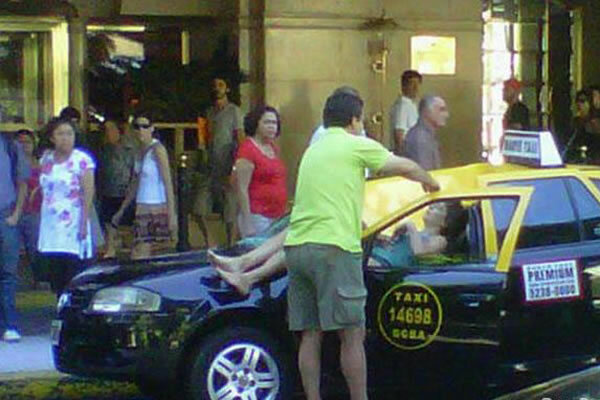 She had fallen from the 23rd floor and landed on top a taxi. However, for some miracle or grace, she survived the fall. The taxi driver, said, he had decided to go out of his car. And then she fell on her roof, falling from 23 floors. �If I had been inside the car, I would have died,� he said. And that is how in synchronizity the televisions camera rolled their cameras in disbelief, and the taxi driver began to cry. The woman was taken to the hospital were she underwent extensive surgery. She was put in intensive care. She had multiple injuries. The image of her falling from the 23 rd floor took the imagination of the people of Buenos Aires that day. For a moment she was the city's conversation. They would mention her over orders, or stand in the streets looking at image of her on the roof of the taxi. She seemed so peaceful, resting there. For some reason everything seemed to be just in place, or prehaps in time. "Bloodless" she lay on the roof of a yellow and black taxi. Others avoided to comment about her, perhaps to avoid thinking about the fall, or maybe for some other reason. On the streets of Buenos Aires some people spoke about the word "suicide" other spoke about the words "hope", "message" and "miracle". Then the television crew and cameras switched it off and followed the radio scent of the next newsworthy story. And so the televsion stopped screening the live image and reports. And so everyone went on with their lives wihtout considering the strangeness of the event. Life went on in Buenos Aires, as if everyday a woman falls from a 23rd floor and survives. I do not much about hope, or miracles, but this woman who first bought a coffee and then took her shoes off, who must have contemplated the view of Buenos Aires, only then to fall 23 floors, and finally land on the roof a taxi who�s driver had just decided to step out, and who for some miracle, survived the fall, sure has a message for us all.